In the winter when the goats are dry, I make cow cheese. 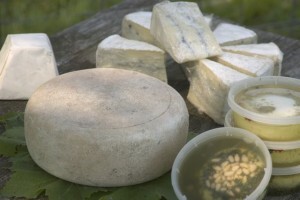 Join me for a day of cheesemaking as I make my weekly cheese. Some weeks I will be making a hard cheese — ranging from a tomme to gouda to havarti to jack — and some weeks I’ll be making a bloomy rind cheese. There is some flexibility as to what we make. The Day is 9 am to 3 pm. Plan to bring clean, waterproof shoes or boots to wear in the creamery.